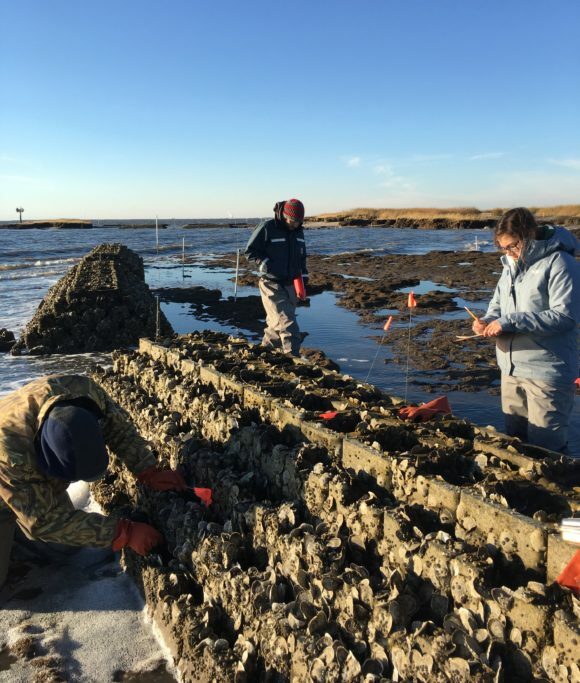 Share the post "Recycled Oyster Shells and ‘Oyster Castles’ Create Living Shoreline Protection Along Delaware Bay"
Rutgers University scientists sample oysters growing on a breakwater reef at Gandy’s Beach along Delaware Bay. The reefs are part of a living shoreline project to help reduce wave energy and erosion along the shoreline. Oysters and ribbed mussels attach to the reefs over time, creating habitat for many species of fish and crabs. Photo: Jenny Paterno Shinn/Haskin Shellfish Research Laboratory. Using recycled oyster and clam shells, a Rutgers University team partnered with The Nature Conservancy, The Partnership for the Delaware Estuary and the U.S. Fish and Wildlife Service to create a living artificial reef along Delaware Bay to protect the shoreline from storm damage. These oyster castles – essentially modified concrete blocks that become living reefs as oyster larvae attach to them and grow – can reduce the impacts of future storms, provide habitat for wildlife and improve water quality. Creating a living shoreline with wetland plants, natural structures and shellfish breakwaters to absorb wave energy and reduce erosion can help protect coastal areas from regular flooding and storm damage. You can get 360-degree views of the living shoreline as part of the “As If You Were There” virtual tour project that features interactive photography and videos. The virtual tour was recently created by the USDA Northeast Climate Hub, collaborating with Rutgers University–New Brunswick and other partners. “The purpose of the virtual tour project is to harness new technology combined with educational storytelling to engage more people in climate informed decision-making,” said Erin Lane, coordinator of the USDA Northeast Climate Hub and project lead visionary. The living shorelines are at Gandy’s Beach and Money Island – important areas for fishermen, oyster farmers and wildlife – in the low-lying Newport area of Downe Township, Cumberland County. The recycled oyster and clam shells were bagged by local schoolchildren as part of Rutgers’ outreach program, Project PORTS: Promoting Oyster Restoration Through Schools. The virtual tour gives people a view of climate resilience planning in the face of sea-level rise and growing storm threats. With the sea level rising – and storm intensity and rainfall projected to increase as the climate continues to warm – researchers are looking to protect and preserve the natural integrity of the coastline. The goal is to make the coast more resilient to protect marshes and upland areas while maintaining the ecological function of the shoreline. 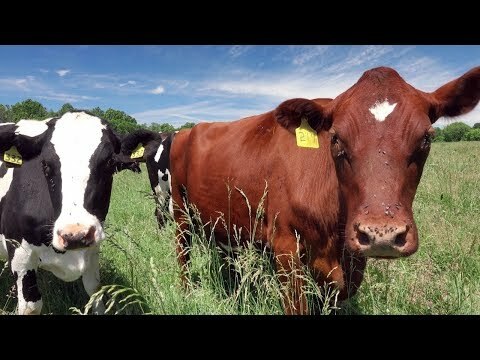 To learn more about climate change and agriculture in New Jersey, visit the Rutgers Climate Institute. Editor’s Note: this article originally appeared Rutgers Today.